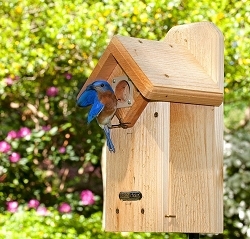 Two Story Bird House with 8 Nesting Compartments! 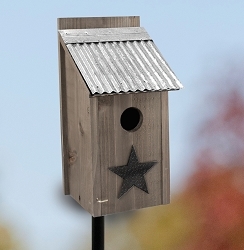 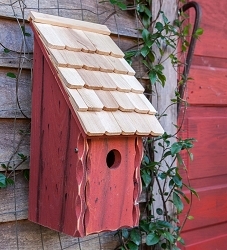 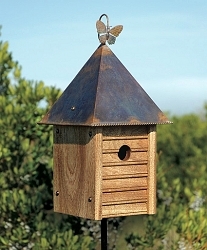 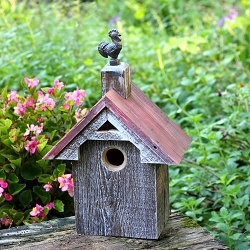 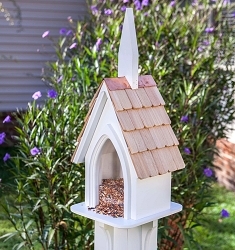 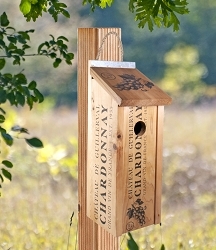 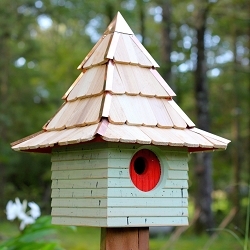 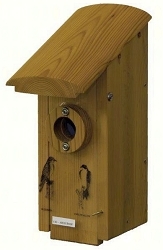 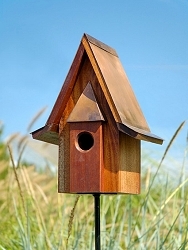 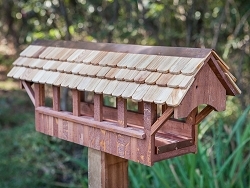 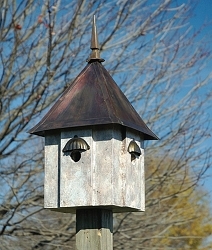 Offer a bevy of birds a lasting and beautiful roost with the Cypress Landing Bird House. 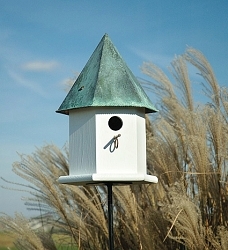 The two stories on this square home offer shelter for several birds, while the generous, verdigris roof adds unique shape to the piece. 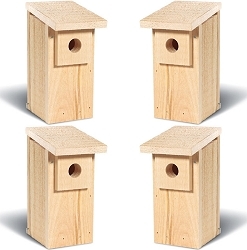 Eight 1.5" diameter entrance holes enable a few birds to enter simultaneously, and the interior compartments create a wonderful, communal roosting area. 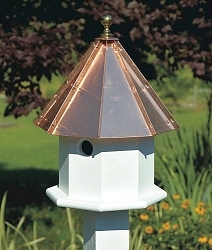 The verdigris colored, copper roof perfectly covers this home, and its slight outward flare adds architectural interest to your yard. 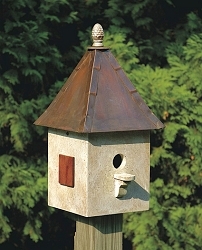 The cast iron finial brings height to the unit, completing the elegant look. 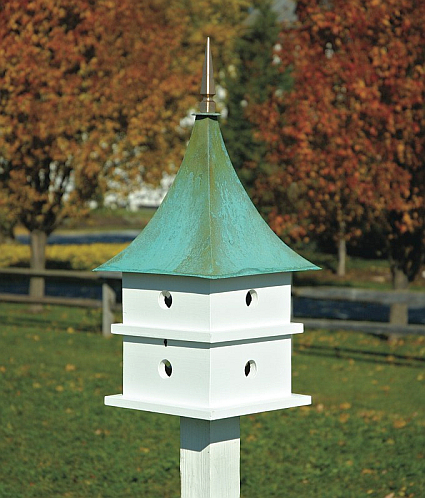 The generous, base platform and ledge provide birds landing and perching spots, while the cellular PVC construction remains durable for many seasons of use. 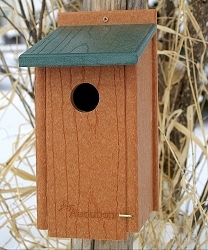 Its vivid white tone contrasts the green of your garden, and this material will never rot or delaminate for a hardy home. 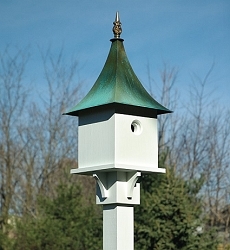 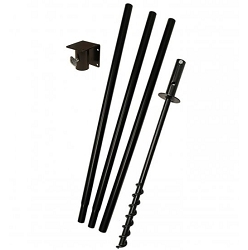 The verdigris hue of the roof enhances the classic motif, and the included mounting bracket allows you to attach this shelter to a 4 x 4 post (not included) easily. 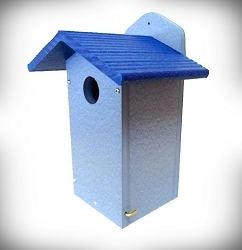 Dimensions: 13" x 13" x 31.25"; 1-1/2" diameter entrance hole; Weight: 18 lbs.